Perhaps unknown to many at the time, especially at the onset of the Asian financial crisis, 1997 would become a huge year for South Korean cinema, turning the tide before the country’s second New Wave. Lee Chang-dong released his multi-award-winning feature length debut ‘Green Fish’; ‘The Contact’ would catapult director Chang Yoon-hyun and stars Han Suk-kyu (who also starred in ‘Green Fish’ and in Song Nung-han’s debut ‘No.3’ that year) and Jeon Do-yeon; and Jeon Soo-il’s debut short ‘Wind Echoing In My Being’ would later screen at the Un Certain Regard in Cannes. Amongst all this, came Kim Sung-su’s tumultuous tale of wayward youth ‘Beat’ – starring the yet-unknown Jung Woo-sung in his breakthrough role – a landmark in the country’s gangster cinema stylings which boasts enough mainstream whilst remaining decidedly artistic in its execution. A tumultuous a coming-of-age gangster odyssey, ‘Beat’ follows the intertwining lives of three young men after they drop out of high school: Lee-min (Jung) is a feared brawler trapped in an existential crisis with no direction in his life; Tae-soo (Yoo Oh-sung), Lee-min’s childhood friend, who carves a name for himself in the local mafia and does all he can to drawn his friend deeper into the group; and Hwan-gyu (Im Chang-jung) who dreams of one day owning his own restaurant. Spanning a number of years, the film concerns itself with the trials and tribulation faced by the trio, particularly with Lee-min’s toxic relationship with Romy (Ko So-young) who falls from grace, along with her other friends, as she struggles to enter South Korea’s educational elite. Testing the limits of its characters, ‘Beat’ immerses its characters in the unpredictable and hostile adult world, a dangerous place no matter the life choices anyone makes. In its endless onslaught of derailing the paths yearned by its cast to live on the straight and narrow, ‘Beat’ prides itself as a ruthless universe, throwing curveball after curveball at those who pour their hearts and souls into their dreams. It succeeds in warming the audience to its cast of, well, beat characters – the ardent student, the hapless fool, the no-good street punk attempting to lead a straight life – and subjecting them tirelessly to a harsh reality where nothing happens the way we plan them. Whilst not on the same soul-crushing level as, say, Park Jung-bum’s ‘Alive’, Sung-su’s film tries its best to chip away at everyone’s luck and patience – sometimes it succeeds but sometimes it misses the mark. Strangely, it doesn’t know how serious a film it wants to be – or what film it wants to be – with plenty of tonal shifts throughout (most notable a moving-in montage which awkwardly stumbles about before crashing and burning) and stylistically clashes with itself. On the one hand, it wants to be gritty and jagged with its raw yet nauseating fight sequences; on the other it tries to be a complex and thought-provoking drama with toxic relationships at its heart – and this is where the film excels, showing how some connections draw out the worst in us. Though hit-and-miss with its approach and its message, which sometimes seems a little on the nose, it is saved by its strong cast, its on-screen chemistry, and a triumphant score which locks it in as a product of its time. 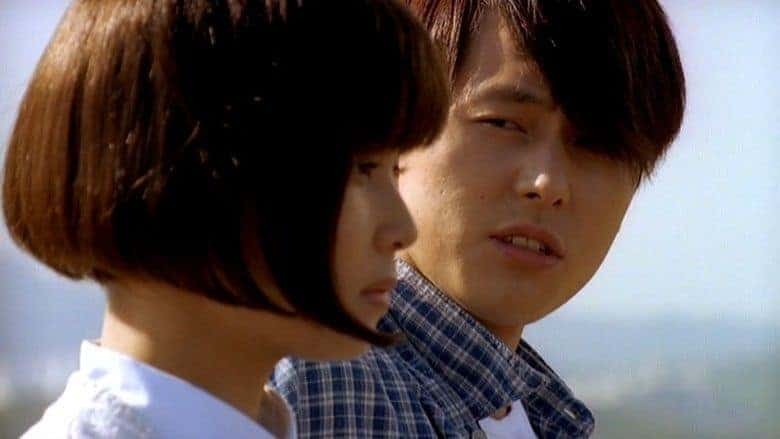 The relationship between Lee-min and Romy is fraught with tension from the get-go and at times plays out like some forbidden romance; we get the sense they were always meant to wind up together but at the same time we know they shouldn’t, a thought as symbolic as Lee-min’s pager and motorbike. The film’s other romance, or bromance, between Lee-min and Tae-soo is questionable by its motivations, not on asexual nature, but in terms of the bigger picture: as the film’s climax slowly becomes apparent – much later than it ought to – we’re left with a frustrating taste in our mouth, one which plays out in our memory long after the credits roll. Visually, this has all the hallmarks of the bigger hits the country would deliver in the years to come. It’s down-to-earth and grounded in a gruff realism – that is until the fight sequences show themselves – with some sharp camerawork. At nearly two hours in duration, it feels a little drawn for what it ought to be but is paced with care and attention. It’s ultimate downfall however, is its editing which seems to try a little too hard at pushing its perplexingly simple narrative. It’s an undeniably ambitious film and whilst it doesn’t offer up the same level of quality the year’s over films had, it is at least an entertaining watch. It’s cast works really well in fleshing their characters out, even if there is little development between them. They show the best way to overcome life’s hurdles is to dust yourself off and distance yourself from those who draw out the absolute worst in us. Loosely based around Jung’s life prior to his acting career and on the book by Huh Young-man, it is a film worth the time in seeing if possible.